I love the good life and particular great food. Good food is meant to be shared. Follow me on my adventures through food, travelling and all that I am passionate about. 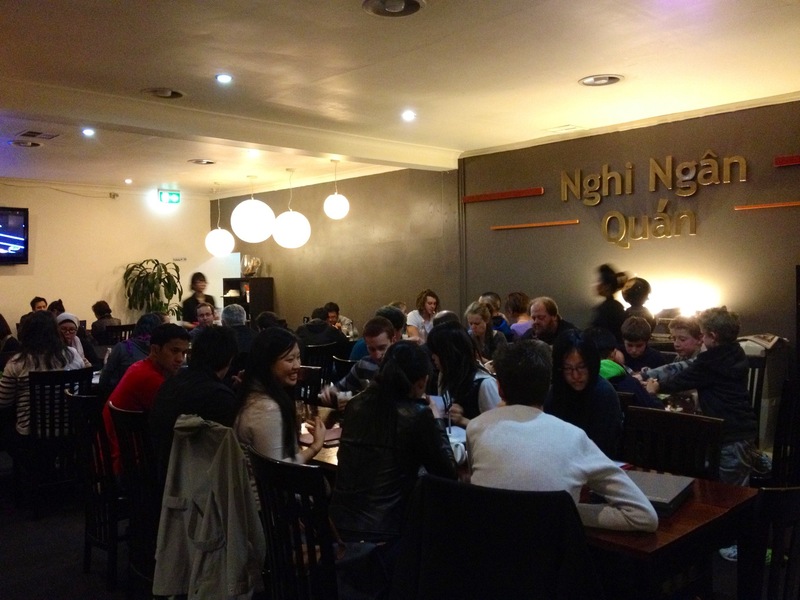 The little hand on the clock had barely reached seven and Nghi Ngan Quan was already pumping on a Friday night. Stuck in the middle of surburbia in Ferryden Park sat this lone restaurant. Its bright fluorescent lights could not be ignored in the dark night. Jostling with other diners to get a car park, I gave up looking for a park in front of the restaurant and found myself parking off a nearby street. I was tempted to park illegally on a large patch of grass near the sidewalk but thought better of it. I was less worried about getting a fine at this time of the day, but more concern about another driver who might block me off my "exit" whilst doing their own illegal parking. Clutching my belongings, I hurriedly made my way to the restaurant hoping not to get mugged in the dark. When I entered the restaurant, I was totally amazed. Amazed by the makeover the place had undergone. It was akin to the role Anne Hadthaway played in "The Devil Wears Prada" when she transformed herself into a fashionista. I remembered eating at this restaurant when they first opened in 2002. It had since transformed a number of times and finally with this current modern makeover. 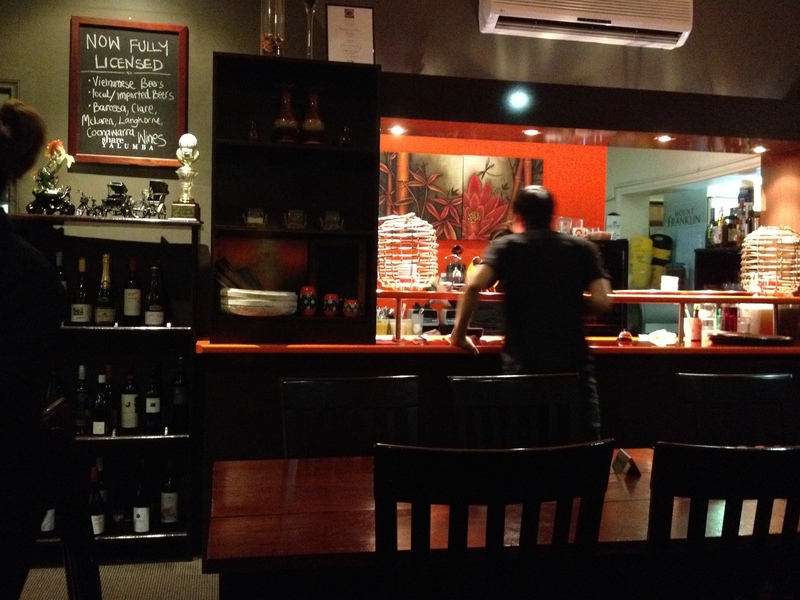 Warm lighting had been used effectively to make the restaurant more welcoming than the previous fluorescent lighting. The newly painted red wall in the bar was a great feature and gave the place a nice feel. I noticed a board saying "Now Fully-Licensed". Wow! They never had a wine list before. Inspecting the wine list, I came across an impressive selection, with local wines from regions like Clare Valley, Barossa Valley, McLaren Vale and Coonawarra. There were also wines from Europe. In addition, there were Asian inspired cocktails like "Lychee and Custard Apple Martini" and "Kumquat Mojito", which I was quite excited about. I wondered when all this happened. It could not have been more than nine months since I came here last. Then again, I cannot be too sure. Hopefully the price of food had not also elevated with the looks of the place. Not expecting this place to be so popular, a booking had not been made in advance. After some hesitation from the waiter, we were spared a table which had a reservation sign on it. Either someone cancelled their reservation or they thought we would finish well before they arrive. Anyway, we were lucky to get a table. Some other walk-ins after us had to be turned away. The menu list was extensive. One of the greatest hurdle was trying to decide what to order when there were literally more than one hundred and fifty items on the menu. This was complicated even more when Vietnamese is not within the usual diet. We ended up ordering Canh Chua Cá (diêu hống) - Sour Soup with Snapper ($24), Bò Xáo Xà Lách - Stir fried beef with lettuce ($14), Thịt kho đậu hủ - Marinated Pork with Bean Curd ($14) and Rau muống xào tỏi - Water Spinach in Garlic Sauce ($10). However, it took awhile for the waiters to take our order, and it took even longer for it to come out. Table water was ordered but this was only brought out after three reminders over a forty minute time frame. It was not off to a good start. We started to wonder what was happening to our food and at the forty minute mark, a waiter came and told us the soup had taken a longer time to prepare and our order should be coming out in ten minutes. There were plenty of staff, all smartly dressed in matching black shirts and bottoms. The staff worked at breakneck speed. One could almost imagine them wearing skates as they weaved in and out between the tables, bringing out orders and clearing the vacated tables. Working here could be quite stressful. There appeared to be two separate kitchens, one on each side of the bar which stood in the middle. One kitchen could be referred to as the "hot" kitchen where stir frying, deep frying, roasting and slow cooking were done. The other kitchen could be referred to as the "cold" kitchen where salads were assembled and where cooking on the stove or in the oven were not required. After waiting a good fifty minutes, our food finally came out. Our first dish was the marinated pork. There was plenty of fish sauce used in this dish and the best part was the fatty pork that had been braised extensively. If you have been reading any of my previous articles like the one on Verve Bar & Kitchen, you may start seeing my love for fatty pork is fast becoming an obsession. My motto is: "Everything In Moderation Cannot Be Bad For You". This extremely savoury dish went well with copious amounts of rice, which is how it is meant to be eaten. In times of war and when people could not afford a lot of meat, such salty dishes were cooked so that only a small amount needed to be consumed, thus making the dish "last longer". One thing that would have improved the flavour of this dish would be the addition of chilli. The amount of black pepper added was just right. 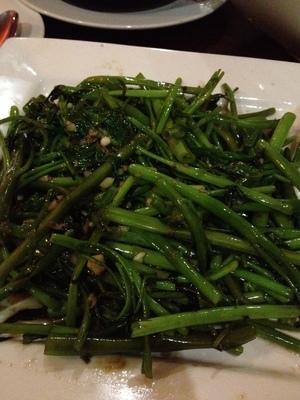 The second dish that came along was the water spinach in garlic sauce. I love the crunchy texture of water spinach. Generously coated in garlic, the flavouring was not bad except to say it was slightly too sweet for my liking. The vegetables were not of the best grade as they were quite fibrous. I supposed the current cold weather has not really been conducive for the growth of water spinach, thus the quality of the vegetable may not be entirely the restaurant to blame. 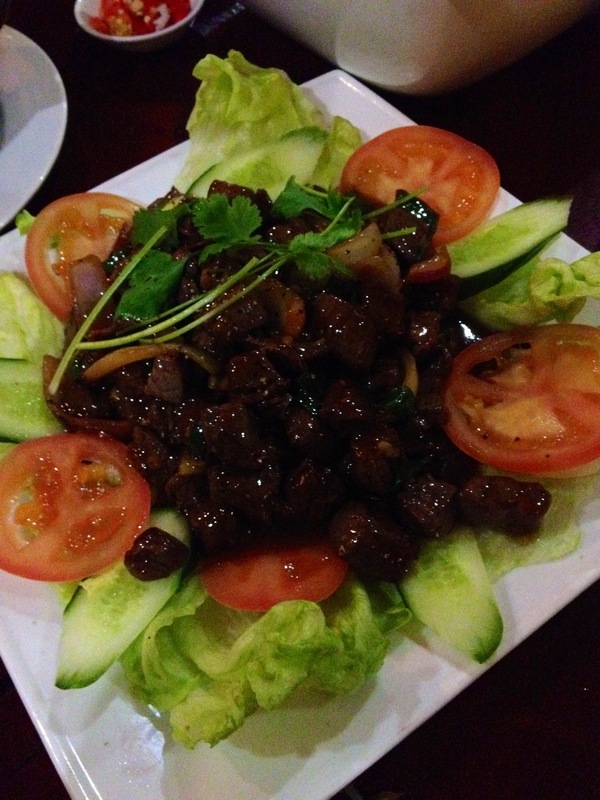 Next was our dish of stir fried beef. For me, a perfect stir fried beef would be cubes of beef seared at super high heat and served medium rare. The sauce should coat the beef but not be gooey. Unfortunately, the stir fried dish here did not fit this description. It was not seared at a high enough heat and was overcooked, rendering the meat a little tough. Strangely, I could also taste five spice powder in this dish which I did not find desirable. 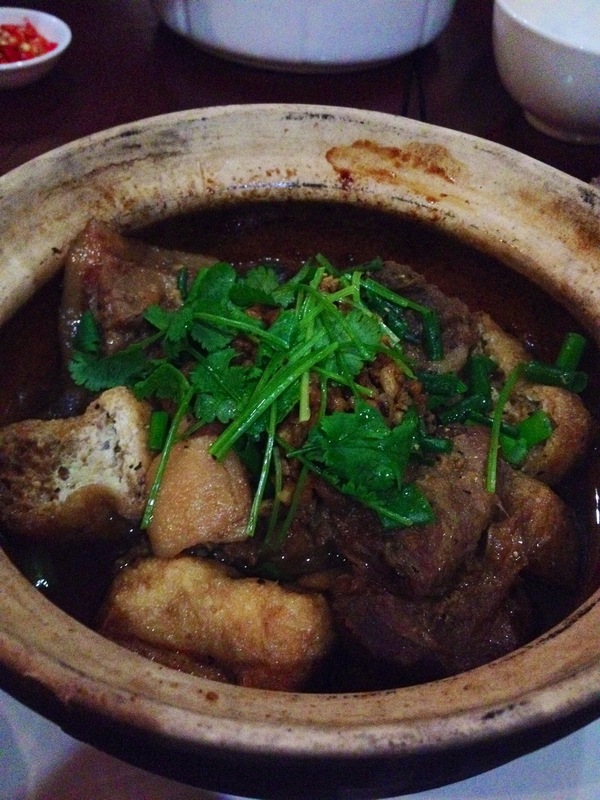 I will not be ordering this dish again at Nghi Ngan Quan. Luckily, the sour soup was fairly nice. The serve was substantial and easily shared amongst six adults with more for seconds. Canh Chua should taste sweet and sour, and with the addition of enough okra, even slightly slimy. I could have had the soup even more sour than what was served. Usually, the addition of more tamarind would do the trick. Funnily enough, the snapper did not really taste like snapper, so I am not really sure what kind of pseudo-snapper fish I ended up eating. Traditionally, the soup is ladled over the white rice and eaten as a dish to accompany it. 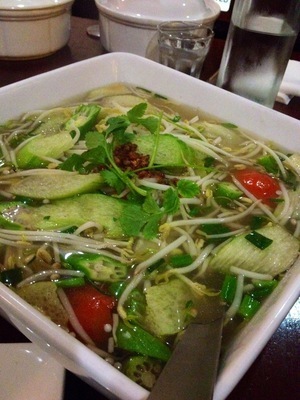 I have been told that canh (Vietnamese soups) are eaten during hot weather to make swallowing rice easier. The seemingly mandatory "Paris By Night" music videos at Vietnamese restaurants were featured on two LCD TV screens. However, I could not hear any of the music as it was drowned out by the loud conversations of many diners. I found myself distracted by the screen as I discreetly checked out the fashion and moves of the young Vietnamese pop stars, but was caught out by my friend when my rice ended up on my lap instead of my mouth. I was expecting to have a relaxing dinner but for some reason felt stressed as I kept wondering when my table water was going to arrive and everytime one got brought out, it kept going to another table. The food just did not come out fast enough. At least, the price of food here is still decent and did not sky rocket with the recent renovations. Nghi Ngan Quan has become such a popular suburban restaurant since its beginnings in 2002. There are plenty of choices on their menu. Bring the kids - if they scream and carry on, no one would even notice with the level of noise present. Cost: Noodles & combination rice dishes (mostly between $9.00 -$12.00), Mains for sharing (mostly between $12.00 - $16.00). Check out their menu on their website. This is our favorite VIetnamese restaurant ! Another excellent review that makes riveting reading. And your images of the dishes are always very high quality. Well done!